hello and welcome to you all . this list is getting shorter and i hope we get more members to join in our cal!! Come make some friends and squares and have some fun!! welcome to our members and any new members or want to be members you have come to the right place. 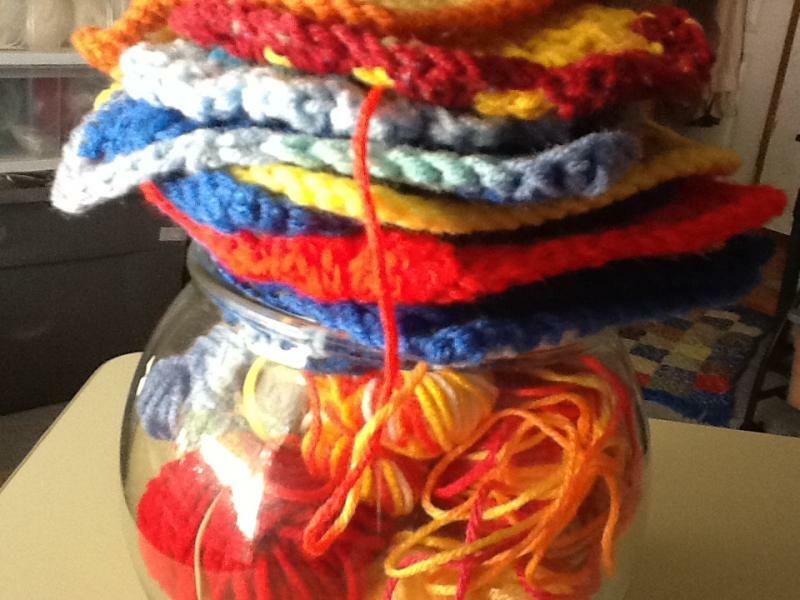 It is pretty simple really, we like to make granny squares. 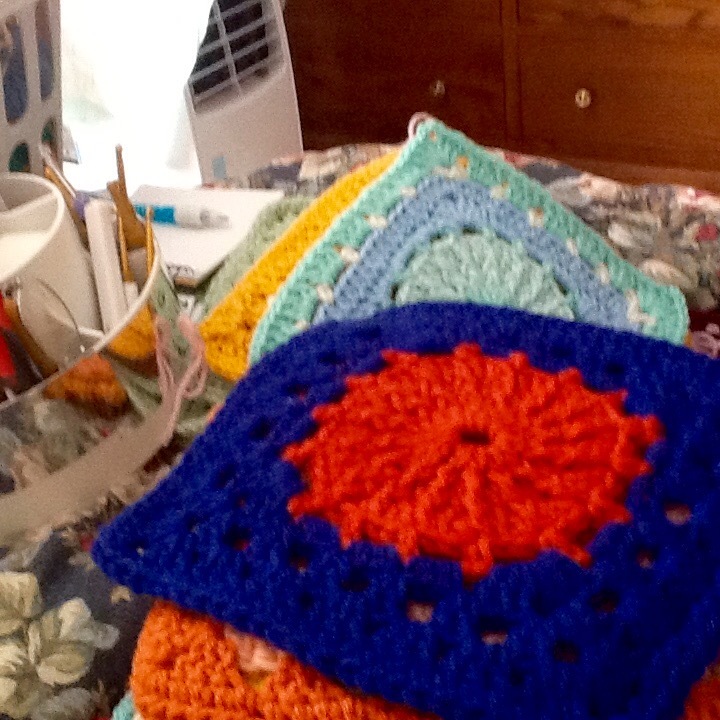 We found the best way to do it was to open up a thread on whom might want or need granny squares to maybe help complete an afghan for themselves or charity or anyone they chose. Every one could use some help as sometimes collecting enough squares seems daunting for any one single person. If you would like to join us and make or receive some squares here is the info I will need from you to get you on our list. We have some angels l members that only send out squares at this time And a lot of us do both send out and receive some that is up to you Again you do not have to send out to receive squares. In shades of greens for instance it could read as such. .
"I am looking for 8inch squares in shades of greens or blues. varigated yarn is ok if in those shades, thank you please pm me for addy " . Please check this post regularly for updates and changes. until i can get info on an update i would advise that you contact the party for current wants and or needs thank uou !! We have lots of talented and generous people on this thread and w like to chat so if you are looking for some squares or some new friends or some place to make or send grannys to or even New Square Friends then please join us. You might end up with a truly one of a kind Ghan that soon becomes one of your favorites not to mention some new friends you might make !! we need some new members to "square" for!! Many of our months are empty leaving us all holding the hook so to speak!! please join us and keep us busy !!! Tampadoll. although not collecting squares but she does send and she gives so much to us all please send her a pretty card as she says she just loves cards! Howieann. she is collecting any six inch squares in Christmassy colors no updates rec. .
Tribble.she. is collecting six inch squares in any color. Immafreak. she is collecting 6inch squares in any colors. Bgs. not collecting at this time but sends!! How bouta nice card ?..or. ?.. Pine Ridge res. is always needing squares for the blankets they make and hand out to those that need them please pm me or check it out on ravelry for much more info squares and much more are always welcome Come be a square with us. I see our new home is ready for us to move into and start unpacking!! I miss a day or two and you all move, I'm glad I found you . I've been a little busy but I made it to the post office todya to mail this month's puffies. Hey hey hey it's moving day yay!! Glad you found us back carol and lacey. We moved cause our thread was gettin a bit long!! Glad you all found us again and there is BGs too this is a good day!! I am just so happy we are up and running in our new home!! I will put up that list too when I get my desk top's graphics card installed it's so much easier there to get my lists. I screwed up and couldn't get on. OWlvamp got any new numbers for us on that midnight brights blankee. how is that going ? what a huge task you undertook but you are getting there so soon it will be no longer wip but an TGID (thank goodness it's done!!). It's good to be in our new home. Hopefully things will get better with a fresh start. Here is the update on numbers and yes, I will be so gratefully when this is done with. I definitely wouldn't accomplished it without you all. Hello! What a beautiful new home! I'm glad to be back and in a brand new home! Well good to see you ms.Holly glad you too found us!! No su. Here today Linad but it's ok birds are enjoying the sprinkles this am. YOuknow I was talking too friend that lives I. Another state and she was Telling me that last year she sent her grand kis gifts and such and put a letter to them in it and they ever mentioned some of things she wrote them about. She asked them and they told her they couldn't read it!! She asked why as she knew her. Handwriting. wasn't that bad was it and they told her no grandma, it's not that we don't learn cursive in school anymore! She was astounded no cursive ?? Wow. She said they will be crippled all thei lives from not possessing that skill. RAndom thought just had to get that out there. I sometime I will look up how many states have stopped teaching cursive and how it has or will affect them later on I life! Astounding for sure huh? Well I do hope you all have a Beautious day today!! I really wasn't expecting iPad toleave that word alone without some how trying to correct it automatically. BUt it did!! I I guess it only likes the little words to fix lik of and am hahaha and ha!! All for now glad for the update owlvamp, those numbers are shrinking right down now to the can do range!! More later. Are we there yet? Imean of course to the 16350 posts mark yet lol!! That is. Lot. Not saying it ha anything to do with my issues with signing in but at least it is one less thing to worry about huh! ITs one of thos undecided temp day here sometimes Im cold sometimes hot turn on the heat turn on the cool?? WHat to do? CLeaned the bathrooms today all but half a tub in one as I pooped out leaning over too long I will finish that late today but the rest is all done and now smells so clean!! Rugs and tub mat washing now! It would be cool if we got more new members would'nt it. For June the up and coming birthday gals are. And are you ready?? OUr ,other b day girl is Sopo and I have not been able to reach her to confirm her addy so you might want to pm her if you plan on sending her squares in June. WEll hope to see you all again later on so have a great Bodaciuos day. Spelled that one right I guess!! Back to work for this'n ! Day two in our new home. Cloudy all day and a sprinkle or two. We made a run out today to pick up my vacuum aka the big blue monster. We dropped it off last Sat for its 3 year free checkup/maintenance. Got it home and vaccumed the floor, the cat's apartment (huge dog porter with her litter box and her blankie, toys and water) and the cat. No wonder she goes undercover when the closet door opens and big blue comes out. While we were out we stopped for groceries. On the way home I noticed that the closed grocery store in the nearest town has its new name up so it should open soon. It will be so nice to not have to drive 30 miles one way for groceries. Morning all!! Its the weekend! What are your plans today? Shopping?? Movies? BRunch or lunching out with friends? Or so some thing like yardwork gardening, cleaning out a shed, garage or closet? HOw will you spend your Saturday?? ITs sunny here but a bit of a chill in the air yet. Max is In The window watching the birds and the two rabbits tht like to hang out there. They used to munnch my Ipatients flowers down to nothing. and then we got smart and the past. Couple of yeara we switched it up to Marigolds in the front flower beds They don't like them i hear no little varmints like Marigolds so they stay away from my front beds !! And i am awaiting a call from daughter about this video card replacement thing to will that happen today? We will see. I have read a bit a out what it did and can be quite a few different things like the video card or even gasp!!! The mother boaard. IM of course hoping for the card thing haha. All for now and we will return later wish her and me luck!!! Just got a. NEw member evertyone!! You all MIGHT have heard of her lol!! MAry Jo the or (Tampa Doll) the the tote Queen, WELCOME has just sent her info in and will be sending for now and she will be In the January bday list when i am done revisiing it!! How cool is that!! LEts all welcome her to our thread!!! Wow every one is busy today huh. Well anyway i put up a partial list of remaining birthdays for 2016.. I Cant believe how quickly the last 4 going on 5 months have past. I cant wait to get more members to keep us all busy!! I just bought some more manilla envelopes the other day and they are a getting very impatient to get puff'a- Fied!! They and the roll of NEW packing tape have begun whispering at night in the dark. I hear words like WHEN and hurry and puff me up coming from the craft room at night. Seriously!! The hooks also are clammoring for attention and arguing who is the best and for what job!! I dont evn want to get into what the skeins of yarn say!! few things and would like to connect t it with another computer first. Trouble shooting I guess. well have not accomplished much today probably wont. True to form afer bending over those tubs and showers yesterday back is a bit feeling it today. Sooo tekki (s) willing i should know by Monday lol. All for now. Got a. Couple thing s non back reelated i want to do so dont forget present to years end list up on first post now. If something i s amiss with your listing please pm me and i will correct it. Thanks all have. A GREAT day. Over and out for now. 30 Milea is a Long way i used to do half that,or a bit more to work AND stop on the way ho home at the store we had a little mom and pop in town but that was really high priced there. To buy moxh you know. HEy thanks for the tip sandra i figured it out!! We need so e eye candy to hang on the walls here s mine. Now your turn. Anyone got some to share with us??? Hello everyone. I hope you are all enjoying the weekend. Tampa Doll, welcome to the group! I'm having a relaxing day sitting on the sofa working on a smocking project for my sweet granddaughter. Aww come. On now eye candy' pwetty please. Our walls are sooo nuetral ! Mary Jo I am so glad you joined us. We left a little before 8 this morning and are just now getting back home (10pm). We had a bonsai workshop this morning and then some of us went for a late lunch(2pm) and visited for quit a spell. Then swung by my sister and niece's house as I needed to drop off the last 2 afghans I made for Project Linus along with a hotpad they wanted for a gift basket. We finalized some plans for my birthday. Its a big one and we have had a couple of hard years with my dads illness and death so we are planning on doing something special. I am excited about the grocery store opening. The other one officially locked the doors two weeks before Christmas but they quit adequately stocking the store 3 years ago. I have definately got in the habit of always having my cooler bags with us so we could stop for groceries here and there when we are out.